ARTIST BIO: Keyboardist/Arranger Bob Baldwin is at it again! He reaches back into his roots of Jazz, R&B and adds a taste of Hip-Hop and brings his friends along for the ride: Marion Meadows, Najee, Phil Perry, Freddie Jackson, Frank McComb, and Jam Band icon Ike Stubblefield. He taps into the balance that he calls “New Urban Jazz,” and captured the essence of the genre as he recorded this disk in LA, NY, Fla., Bermuda and the UK. His latest CD, "NewUrbanJazz.com" is his interpretation of funky jazz at the top of his game. 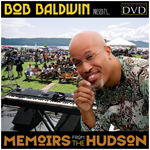 Mount Vernon, NY native Bob Baldwin is unquestionably an unsung hero when it comes to the Contemporary/Smooth Jazz genre. Why, you say? With each project released, Baldwin promptly delivers the goods. Fortunately, this journeyman was blessed to be taught to play the piano by his father (Robert Baldwin Sr.). Meanwhile, we should seriously consider his musical influences as a youngster with the likes of Stevie Wonder, Patrice Rushen, Chick Corea, EWF, Joe Sample and Ramsey Lewis, Miles Davis and George Duke, as their voicings can distinctively be heard in his music. Yes, its obvious this cast of prominent players had a profound impact on Baldwin’s musical journey. With Baldwin's natural ability to weave life's experience into music while creating inventive harmonies, he doesn't really need to fill his releases with high-powered guest appearances. However, Baldwin has used the likes of Roy Ayers, Gerald Albright, Dean James, Jeff Kashiwa, Dave Mann, Chieli Minucci, Phil Perry, Kim Waters, Will Downing, Marion Meadows, the late Grover Washington, Jr. and Noel Pointer, Tito Puente alumni Ray Vega, Brazilian Percussion Cafe' on previous recordings over the years.